Wolfgang Amadeus Mozart. Very Good. In very good packaging. 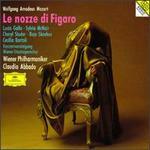 Mozart: Le nozze di Figaro. Good. Good condition. Audio CD. 3 disc set. Slipcase Good. Case Very Good. Disc slightly scratched. Quality guaranteed! In original artwork/packaging unless otherwise noted. Very Good. 028944590326 This CD, artwork, case, and chapter insert are in very good condition. Plays fine. Not an ex-rental. Free Tracking. We ship daily.